To help transition Japan to a peace promoting post-carbon country while enjoying every step of the process. ＊10/25/2014 Just made a new page called GIFTivism, check it out! Living Permaculture began when I was a intern at the Bullocks Permaculture Homestead (BPH) in 2010. This was my first experience in blogging, and I wanted to both document and spread the fruits of my life as an intern. Check out the Bullocks Permaculture tab for more info. It became sort of a photo-journal. Slowly, I decided my mission was to spread the experience and learning to my people in Japan. After my second year at BPH in 2011 (post-Fukushima nuclear meltdown), I decided to move to Tokyo to be a full-time activist. The nature of my articles changed to my social-political views and activism. 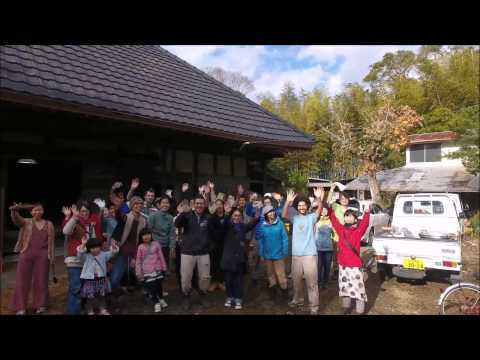 I also started a new blog called Tokyo Urban Permaculture that is written in Japanese with frequent updates about workshops and projects that I am doing in Tokyo and beyond. I love living off the land, gardening in my boxers or naked, eating fresh food all day, hanging out in nature with friends late into the night. But, I also love trying to change invisible structures (politics, economy, culture, legal systems) that are rapidly destroying our generous host (Earth). My view is that if we don't change cities, the centers of political and economic power, we won't have a chance of survival. Fukushima was the most vibrant organic farming area in Japan and was famous for high quality organic produce. The Fukushima nuclear meltdown wiped them out. Who wants to grow or eat radioactive organic produce? Once a hotspot for alternative farming, now a radioactive hotspot. The power plant was run and regulated by Tokyo Electric (TEPCO) and the national government, who both have their headquarters in Tokyo. Wallstreet is the same thing. There are less and less places to hide in the world from these political-economic forces that promote climate change, environmental exploitation, and oppression of people all over the world. Some friends say we just need to leave the old system and create better systems while the old paradigm crumbles. Great idea, but then what happens to all those who cannot leave the system and continue to be oppressed? What if the old paradigm crumbles wiping all of us out (e.g. nuclear war, drastic climate change, etc)? It's an ongoing debate and its probably important that we all work on various solutions since we might not ever no the "right" answer. So, here I am, doing my activist thing, living in the Matrix. I really enjoy social change work. It's a engaging creative process and a world of possibility. I'm here on earth to serve humanity. There is a powerful force that keeps me doing this work. I've been inspired by so many wonderful change makers, Vandana Shiva, Satish Kumar, Thich Naht Hanh, the Bullocks family, Yoshikazu Kawaguchi, S.N. Goenka, Kumi Naidoo, Joanna Macy, Lynne Twist, and thousands of youth who are driven by passion, hope, and a love for the world. What could be more exciting than working with these people for the future of humanity?!!!! Yah mun! And it all starts with healing ourselves and learning that we all inter-are. Many of us are wounded healers, finding our way back to our power so we can serve. I'm always looking for collaborators and supporters!!! All of these are global movements, I like to be boarder-less. The name of my Japanese blog and activities in Tokyo (and beyond). 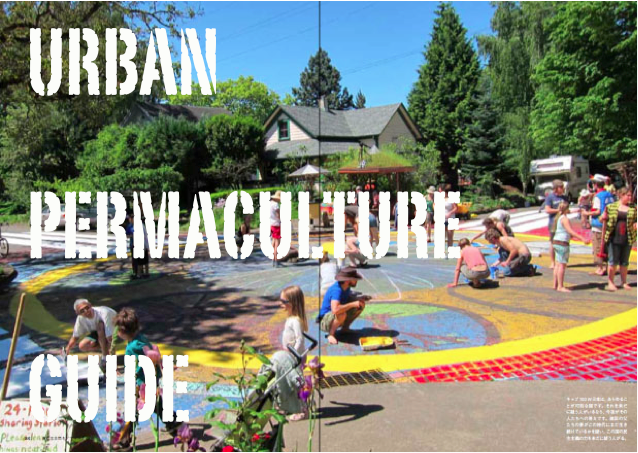 I do workshops on urban permaculture, compassionate communication (NVC), mindful living and meditation, and activism. The workshops are almost entirely donation based, and my experiment is to see if I can not only survive, but thrive on people's gifts! Besides money, I sometimes I get a CD, fruits, natural farmed rice, help with my blog, etc. I want to live in a gift economy! So, I decided I might as well start. Its all an experiment so I'll keep you updated as things change, but I am confident that the earth and its wonderful inhabitants will support me on my mission to co-create a world of love for all beings. Below is an English page with more description. 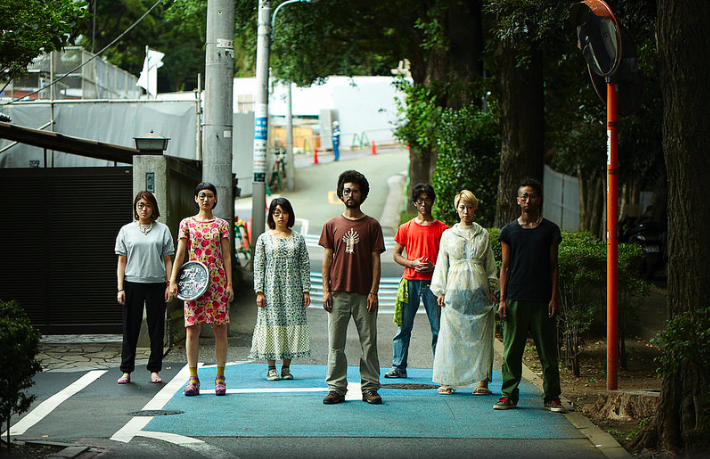 With over a dozen supporters, we're making Japan's first urban permaculture book. We want it to be visually appealing, easy to understand, practical.......and of course, revolutionary! 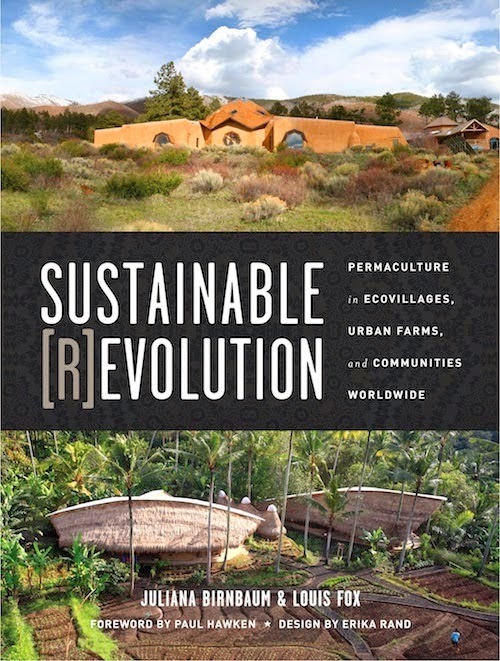 Another book was published recently with articles I wrote on the natural farming movement in Japan, chinampa agriculture (Central and South America), and profiles of permaculture farms/movements in Thailand, Orcas Island (WA), and Portland (OR). "Global Power Shift is the starting point for a new phase in the international climate movement. 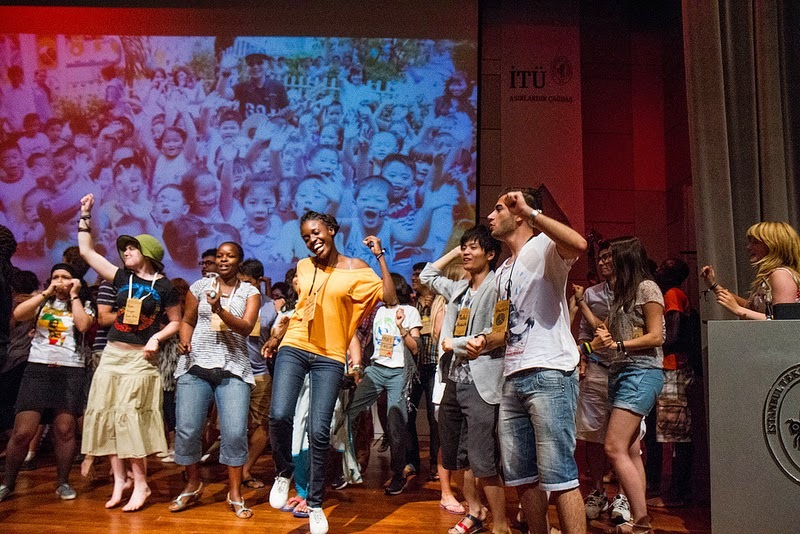 First, hundreds of climate leaders from around the world gathered in Istanbul to share stories, learn skills, and sharpen strategies. These leaders have now returned to their home countries to spark a wave of convergences, campaigns, and mobilsations for climate action." 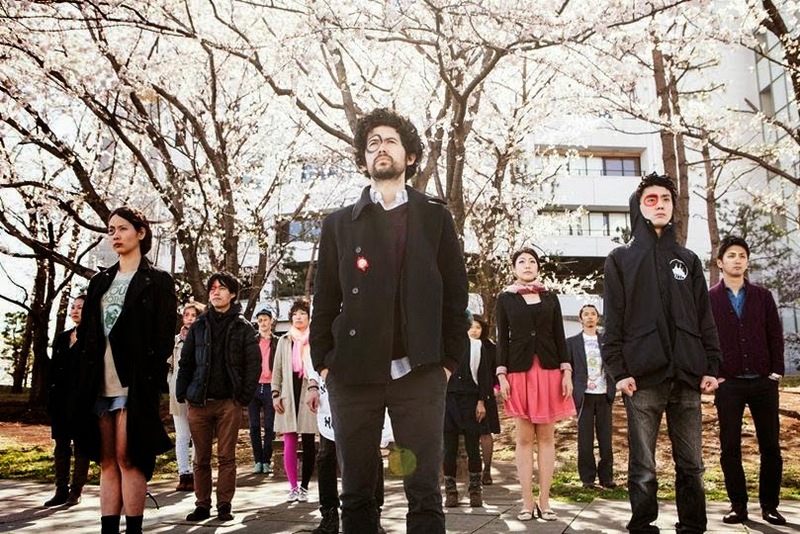 I started Power Shift Japan with the twin goals of youth empowerment and climate action. Our current campaign is to create 100% renewable energy powered universities. The university I attended, University of California Santa Cruz, accomplished this in 2006 through strategic student activism. Since Japan is embroiled in a nuclear disaster and climate inaction, I figure this is a fun non confrontational project! This is another global climate action youth movement that I am trying to implant and grow in Japan. Its an environmental campaign that doesn't look like one. Mischievous and mysterious. I like the EU version below a lot. So cool! contribute to building a healthier and a more compassionate society. We want to help our world which is overloaded with intolerance, discrimination, craving, anger and despair. Seeing the environmental degradation caused by our society, we want to live in such a way that our planet Earth can survive for a long time. Practicing mindfulness, concentration and insight, enables us to cultivate tolerance, non-discrimination, understanding and compassion in ourselves and the world." 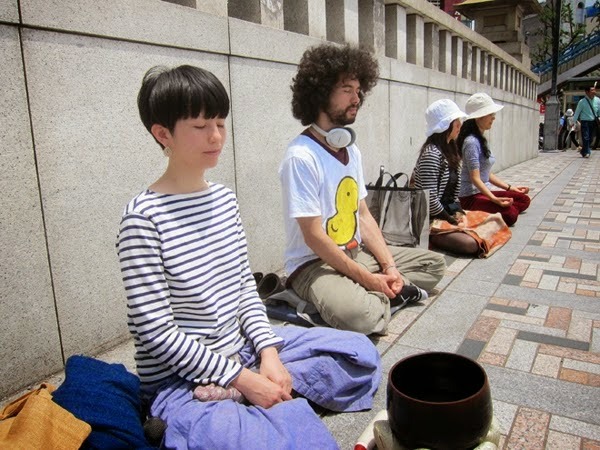 In Tokyo, we've done a few meditation flash mobs in Harajuku (Tokyo youth fashion center) and a few days of mindfulness at cafes and the park. Currently planning to start working with students at Meiji Gakuin University, and doing evening meditations at a groovy temple in Totsuka (Kanagawa). 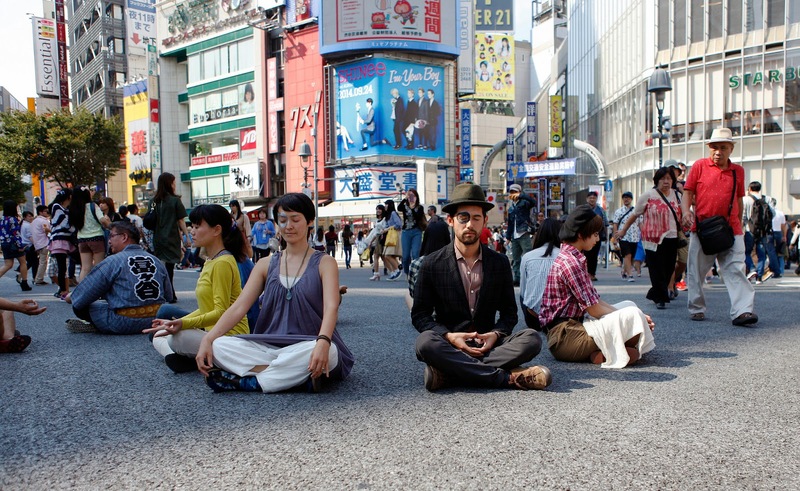 My TEDx talk on "stopping" where I introduce our first meditation flash mob (same as the pictures above). Right as we were about to meditate police came (probably because I wrote guerrilla mediation in Tokyo everywhere), but instead of reacting, we just sat peacefully. And 30 minutes later, I opened my eyes and they had vanished. Much like many of my daily fears. By the way, this talk was a major stretch for me since I experience intense stage fright. But, I designed in mindful breathing time in my talk so I could really practice what I wanted to share. After the talk, I was invited to do a guerrilla meditation at the reception of the TEDx event. At the peak of the party when the participants were loudest, merrily drinking and eating, rang the bell and sat with a few others. The mindful energy (and probably shock and curiosity) slowly spread and the entire room went silent. Professors, students, business people, all meditating, many for the first time. I really appreciated the opportunity to practice with an unassuming audience. Also, the afro is key! I'd like to share an audio interview I did with a new friend from Japan, Yuka Saionji. I met her at a Leadership event featuring Lynn Twist that I helped organize. Super cool event with lots of different types of people congregating. Yuka does a lot of cool things, but one that we really bonded early on was the gift economy experiments she is involved in. She introduced me to Nippun and his wife Guri, and Pancho who started up Casa de Paz in East Oakland. More on these amazing beings later (highly recommend looking them up). I had a really great time doing this interview with Yuka and hope you enjoy it too. Below is the description, an extension from my TEDx talk on Stopping. -we will self-publish with the support of crowd-funders to make this a people's project and keep the gifts flowing. This book is an invitation to change the world that we live in. It was not created to merely be a consumable product, but designed as a tool to inspire compassionate action. I want you to join me, and the millions of people around the world, who are dedicating their lives to practicing compassion for all beings. Our goal is to co-create a future where all people and all life matters—a world that is ecologically sustainable, socially just, and spiritually fulfilling. I want each reader to know that you are invited on this exciting adventure, and that your diverse gifts are essential for this movement of love to flourish. And, we’re going to have fun! The following pages are a collection of “seeds” with an enormous amount of potential to grow. In order to unleash that potential, the seeds need to planted, the sprouts to be watered, and the fruits to be celebrated. It’s all experimental and if things don’t go exactly as expected, let’s harvest the learning! This process of cultivating our consciousness is at the heart of our (r)evolution. Mindful breathing is probably the most important practice I can share. I really really highly recommend it. Imagine if were could enjoy every breath. *sometimes I'm overwhelmed with emails so I might not respond immediately or at all. Especially if its inquiries about things I've already posted the answer of on the blog. If its urgent, or you really want to help me, send me a reminder:) Gracias. 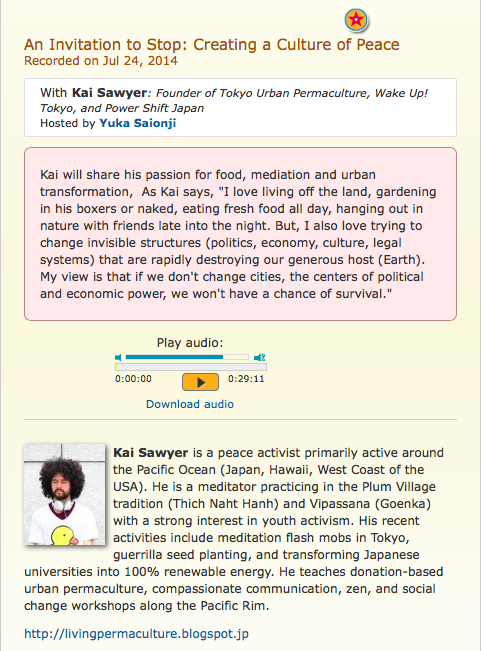 Dear Kai, it is very nice to hear about you and your activism. I would love to get involved but at the moment I am studying here in Kansai, so it would be nice to hear about things that happen in closer proximity. Do you know about any initiatives, individuals, projects and so forth that are taking place around here? ( Kyoto but also Osaka, Shiga, Kobe etc.). I would love to hear about it and get this thing going. All the best. I am looking forward to your answer. *the ratio of English to Japanese changes unexpectedly so if there is a lot of strange foreign characters, check out older articles might have the more familiar alphabet.